hen I finally got home, I wiped the glass and everything looked just as good as when I left; all of my automation worked perfectly. Yay Automation. It seems to me that we hear a lot about automation disasters, but not so much about automation successes. That makes sense because disasters tend to stick with us when we hear about them, and we just don’t talk about everyday successes because well, they are just regular every day happenings. So, here is a non everyday automation success story. Recently, I had to leave town immediately and unexpectedly for what turned out to be several family medical emergencies in succession (it was difficult, but everyone turned out to be fine). I was gone for 10 days with no time to prep the tank, though I did franticly arrange with friends and colleagues to move some octopus I am working with to a lab at UC Berkeley. The whole time I was away I thought about my reef tank exactly once on day 4, the first extension of the trip, when my wife and daughter asked me if they were feeding the tank the right way. While in the hospital dealing with emergency room doctors and drama, the back of my mind was not also busily worrying about my home systems, I was able to focus on what was right in front of me. 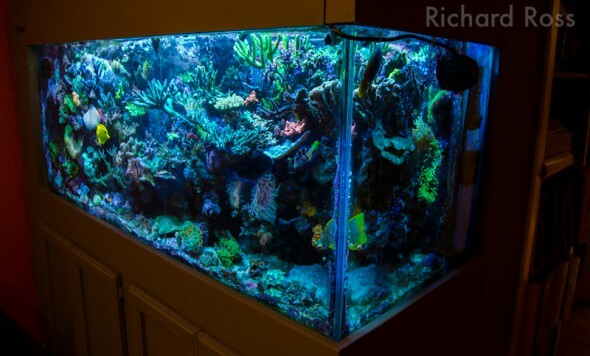 My advice – automate everything you can on your reef. Not only will it free you from the some of the drudgery of every day maintenance and help keep the system stable over time, but it will give you some piece of mind when you are out of town on vacation or for an unexpected emergency.